Besides sneaking onto my mom’s computer and writing to all my blog fans, Dakota and I take our job of home security very seriously! I usually patrol the back of the house. I walk into the dining room and look out the window over my mom’s garden. There are always birds flying around, and once spring comes and the veggie are planted, rabbits and chipmunks run amuck! It’s my job to bark and run to the back door so Mom can let me out. I chase those critters away and protect her garden and our house. At night although I may relax next to Mommy or Daddy while they pet my head, I don’t shirk my duties. I sit by the big window and gaze into the night. I know what you are thinking. How can she see anything when it’s dark out? Dogs have excellent night vision. But I also use my hearing and I know if anything moves outside. It could be the light of a car pulling into the driveway or a dog running across our yard. No matter what, if I think there is danger, then I must let my parents know! I’ll bark and whine and run to the back or front door just so someone will let me run out and do my job! Dakota usually is laying on his side like a lazy security guard, but once I sound the alert he is all business. His bark is very scary and the UPS man and the mailman will NOT come onto our lawn if Dakota is outside. No sirree! I may be head of security, but Dakota is the best when it comes to a real intruder. When Dakota was little, he was very afraid of our dark haired and tall male family members. I’m not sure what it was, but maybe they reminded him of someone who wasn’t so nice to him. 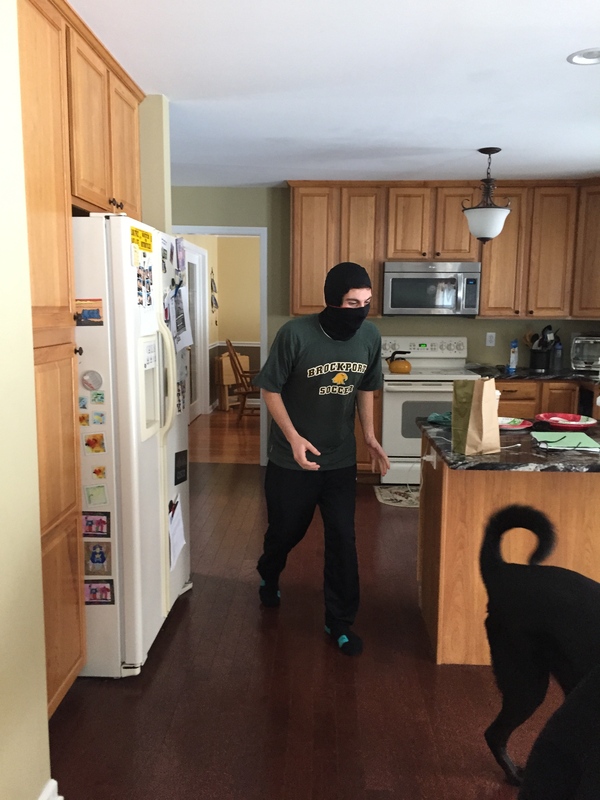 One day, Stephen happened to come downstairs with his ski mask on. He may have been getting ready to go play some outdoor hockey or who knows what he is up to. Well Dakota took one look at him and flipped out. He slid onto his feet and almost tackled Stephen! Luckily, he knows Stephen’s scent (eau de teenage boy!) and stopped short of biting him. Then he ran away! I have to say, I got caught up in the adrenaline because I ran over, too. That Stephen fooled us both! Stephen chasing Dakota after Dakota nearly takes a bite out of him! Dakota has had enough of this prank! His job is done! 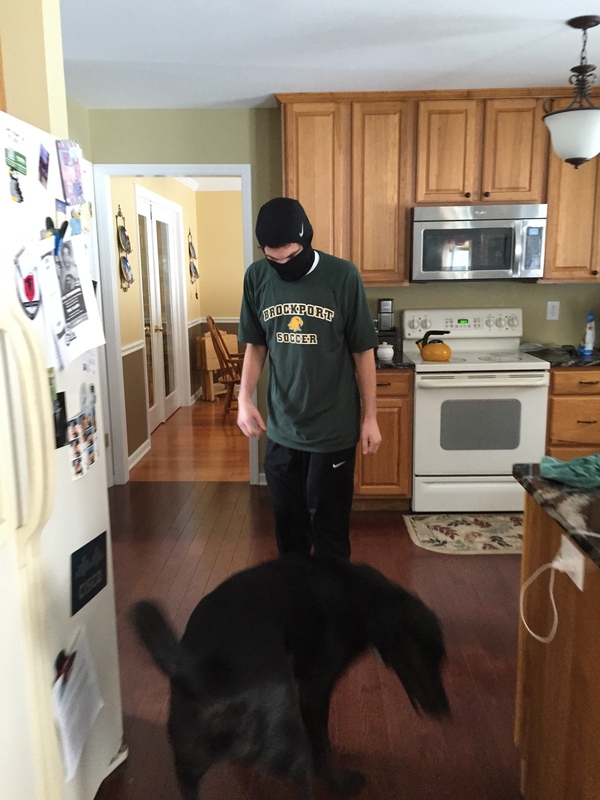 I know that if an intruder ever broke into our house Dakota and I would defend our family and our home. And I continue to battle the critters who attempt to invade my mom’s garden and my dad’s garage! Having a dog is the best alarm for an intruder alert! And we can count on Stephen to keep us on our toes! Stay tune for next week when I hope to have my interview up on the Amazing Nero–Pet Therapy Dog! I know I missed writing last week! I need my own computer between my mommy always typing and Stephen watching YouTube videos! Plus our TV broke so the other night Daddy was using Mommy’s computer when Mommy wanted to use it! You’d think we only had one computer in the house! Anyway! It’s a gorgeous sunny day outside and the snow is melting. Before I run around outside and get some much needed sun I want to tell you about my friend Shelby. Shelby is a part Labrador and German Shepherd girl. She’s only 15 months old, so she’ still getting use to the world. Her mom, Vicki, is my mom’s supervisor at the Clifton Park-Halfmoon Public Library where she works part-time. I went there to visit a long time ago and want to go back to visit. This is Shelby. Isn’t she a cutie?! Just love the sweater! Vicki adopted Shelby when she was three months old. 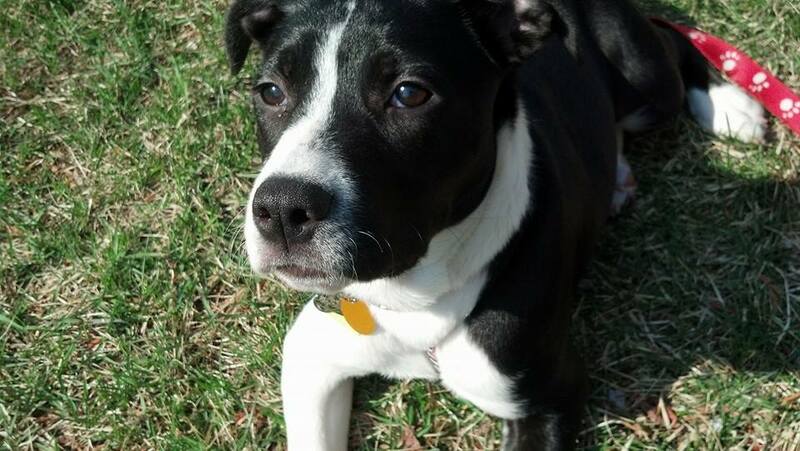 Shelby was rescued from a kill shelter in North Carolina, along with her siblings, luckily. I don’t even like to mention the words kill shelter because my fur stands up and my curly tail falls limp to the ground. Shelby and Dakota could probably relate since he was just abandoned. I can’t imagine how Shelby felt being brought to some cold place where she could die! 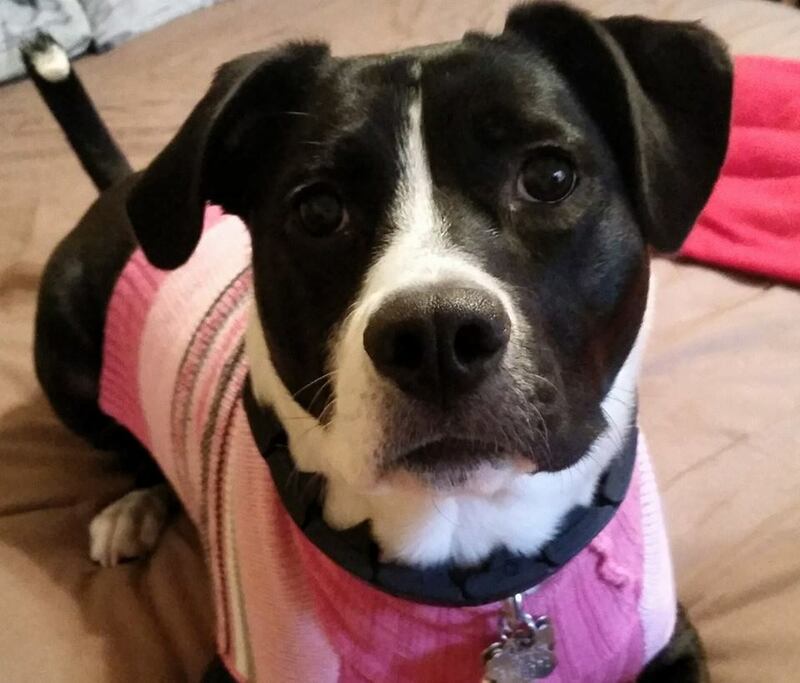 Thank goodness Vicki rescued her when she was found at a Petco store a year ago this April. Shelby says that Vicki came right over to her and Shelby knew immediately that she had found her “forever mom.” Because Shelby was used to hearing so many other dogs around her, her mom kept the TV on for her when she first moved home. She sleeps in a crate, which is very comforting to us. Shelby loves to be active. Check out the white at the tip of her tail! Very unique! Shelby has a brother named Charlie. Shelby says Charlie is funny looking. Even though Charlie hisses at her, Shelby insists that Charlie loves her. I never know with a cat, but Dakota shows his love in very interesting ways, so I’ll leave it at that! Shelby definitely has a connection to Charlie since she tries to get up on the furniture like the cat. She is a good-sized dog so that must look pretty hilarious! Vicki is strict with Shelby and that’s ok. We dogs like to know our boundaries and rules. As she gets older, she’ll be able to do more things around the house. Even though there are rules Shelby has a great time playing ball and chasing the light. Shelby’s favorite place to go is the dog park where she can play with her friends. I’m going to make a play date with Shelby so we can hang together. I may need to leave Dakota home since he has an aversion to playing with other dogs. Can’t wait to play with Shelby at the park! Shelby Loves Loves Loves finding BIG sticks outside and chewing them! I do too! Her Uncle Fred plays laser light with her. She does go crazy because she can never catch it. Shelby, I think that’s the name of the game and it’s probably more entertaining for the adults than us. 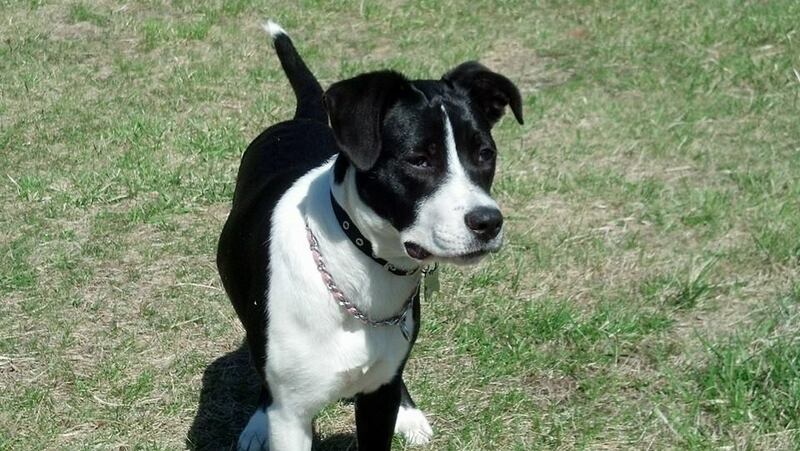 Shelby’s mom says she is very good-natured and loves everyone. She enjoys giving kisses and wants to be around her mom and her friends. I’m so glad that Shelby has a wonderful home and is happy. Every dog deserves a special home so adopt one today! We found Dakota on www.petfinder.com or visit your local pet store and find out when they have adoption days. Puppies are adorable, but there are so many senior dogs who need a home too. Visit www.mrmoproject.com to find some who need love and a warm home. I’m sure your dog can’t wait to find you.